That’s the tagline for John Maslowski’s animated short, which he is credited with being the writer, producer, director, as well as a voice-over actor. In the short film, two animated Zombies briefly discuss The Walking Dead, Norman Reedus and a trip to Starbucks. So, what better preparation for tonight’s mid-season premiere than to watch this animated short in getting hyped for the return of basic cable’s highest-rated TV show? Now that Andrew Lincoln is no longer leading the band of survivors during the Zombie Apocalypse, Reedus’ character, Daryl Dixon, who has long been a strong supporting character, finally steps into the spotlight to fight the undead… and now The Whisperers. The Hollywood Sun Awards awarded it best short animated film for May 2018. The Independent Horror Movie Awards awarded best short animated film for June 2018. The American Filmatic Awards awarded it Honorable Mention for Best Short Animated Film. The Summer Alternative Film Festival awarded John Maslowski the Best Writer Award in the Super Short Film Category. The Hollywood West Wing Film Competition awarded it best short animated short film for May 2018. 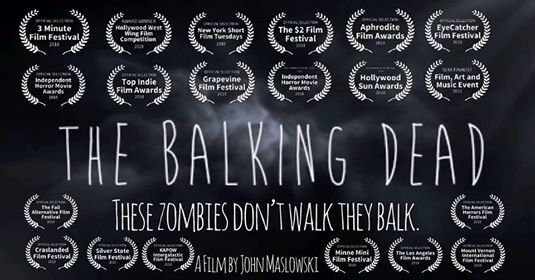 Balking Dead features some cool, creepy atmospheric music that plays in the background while the two chatting main characters could easily represent any two fans of AMC’s The Walking Dead, who could be found anywhere around the world. There really isn’t a time frame of when their discussion takes place, but since they can be found sitting on a couch, it’s a good bet they’re either preparing to watch TWD or they just watched an episode of the show. The conversation bounces around from The Governor, to Negan, to Norman Reedus, to comic convention appearances, to The Boondock Saints, to Amazon Prime and finally to Starbucks. It feels like a referendum on popular culture and how fans can quickly discuss different topics (as well as expecting instant opinions on the subject matter). These are conversations that feel familiar and funny… very real. Check out the link to watch The Balking Dead and get ready for Season 9 as new episodes of The Walking Dead return, airing on AMC tonight!